The Fall Tour de Feud 2.0 is one of Hatfield McCoy Heritage Days Homecoming’s many great outdoor events, and is an open road cycling ride that is scheduled for the afternoon (12:30 p.m.) of Sunday, September 23. Hatfield & McCoy Heritage Days Homecoming will begin Friday, September 21, and will go through Sunday, September 23, 2018. Ride will be leaving Belfry High School. The PCFC will be hosting an Open Road Cycling event in conjunction with the Hatfield & McCoy Festival on Sunday September 23, 2018. The ride will depart from Belfry High School at 12:30 PM on Sunday 9/23/18. This ride will wind it’s way along KY 319 toward 1056 E at Blackberry, KY. Along the way there will be several unique and historic Hatfield & McCoy photo opportunities along the Randal McCoy Trail. The first stop will be at the Randal McCoy homestead at Hardy, KY located just of KY 319. The second will be at the Hog Trial Cabin at Blackberry, KY at the intersection of KY 319 & 1056. Once the riders hit the Hog Trial Site at Blackberry, KY the ride will hang a left and proceed down 1056 E toward McCarr Park and the historic town of Matewan, WV. The majority of the ride is relatively flat and follows the Hatfield McCoy Marathon course along KY 319, which is the Randall McCoy Trail toward Blackberry, McCarr & Matewan via 105. This route is roughly 12 to 13 miles. Riders should note that there is one small climb up Blackberry Mountain on the 319 section of the course otherwise, it’s a relatively flat open road course that should be considered a beginning to intermediate level ride depending on the distance and pace. Once the tour enters into WV riders can abandon the ride at Matewan or continue along WV 49 & 65 toward the birth place of Devil Anse Hatfield which is located at the mouth of Straightfork hollow just past Double Camp. There are several historic land marks along this route. 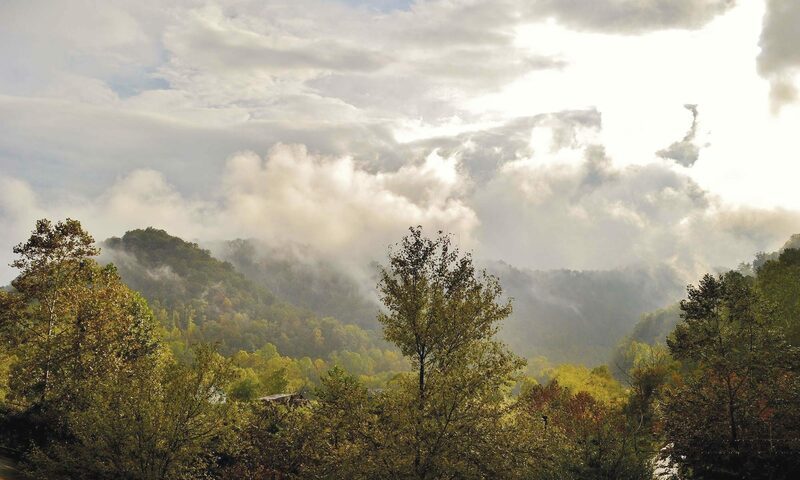 Straightfork is located roughly 9 miles above Matewan between the communities of Red Jacket & Beech Creek. From there the ride will return back down WV 49 toward Red Jacket where it will conclude at the Depot in the historic town of Matewan. Riders of all skill level are encouraged to participate in this event. Like past Tours you may adjust the length of your ride to suit your fitness and skill level. This course gives riders of variety of options from 5 to10, 15, 20 or 30 miles. Registration will take place the day of the event starting at 11:00AM at the staging area which will be located in the FRONT parking area of Belfry High School Gym Complex. BHS is located just of US 119. Donations will be accepted throughout registration on the day of this event with a portion of each donation including an event tee shirt and a photo with several of the living members of the McCoy & Hatfield family who annually support this festival each year. For questions, contact Jim Bevins, PCFC Trails Coordinator (606) 454-0004. T-shirts for this event will be available, pre order ONLY. See the facebook page for details. Please place you order by 9/13 for pick up the day of the event 9/23/18. The Tour de Feud is a biannual open road cycling event that’s held twice a year. The first ride, held in spring, is scheduled for the second Sunday in June. This event follows the Hatfield McCoy Marathon which is now in its 20 year as of 2018. The fall Tour de Feud cycling event is done in conjunction with the Hatfield and McCoy Heritage Days Homecoming which is held September 21, 22 and 23, 2018. Hatfield McCoy Heritage Days Homecoming is a three-day event that features outdoor events, live entertainment, meet and greets with feud descendants, and a pig roast at the Pikeville Farmer’s Market. The event ends with a special memorial service at the McCoy Well in Hardy, KY, lead by Hatfield and McCoy descendants. The Spring Ride starts at Blackberry Park located just off KY State Route 1056 then proceeds over into WV and follows WV Rt 49 toward KY 292. The Fall Ride starts along KY ST RT 319 and proceeds up The Randal McCoy Trail toward the Hog Trail Site and KY ST HWY 1056. From there the route crosses over into the town of Matewan and follows WV ST RT 65 toward Red Jacket, then onto WV ST RT 49 back to KY HWY 292. Each event takes riders past many of the historical landmarks and feud sites which exists on both sides of the river. The Blood Feud Hatfield and McCoy Ghost Walk will be held September 22 in Pikeville, Kentucky, during Hatfield McCoy Heritage Days 2018. Discover the story behind the infamous Hatfield-McCoy Feud, and tour key locations in Pikeville, KY that are significant to this blood feud. The tour guide will be exploring spooky and weird occurrences that happen in Feud Country, even to this day. The Blood Feud Hatfield and McCoy Ghost Walk will begin at the Pike County Tourism Visitor Center, 831 Hambley Blvd. Pikeville, KY, and will progress to the Pike County Courthouse. The tour will culminate at the Eastern Kentucky Expo Center, where a paranormal investigation will be held. Participants are encouraged to bring their own instruments for paranormal investigation, as few will be available. Tours will be held at 8:00 p.m. and 9:00 p.m.